Can We Use Reserve Funds to Offset Excessive Costs From This Winter? 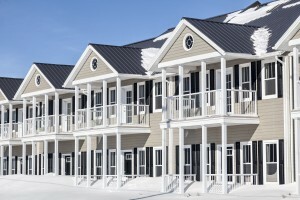 This tough winter in the northeast is sure to impact condominium associations’ budgets. From experience, condominium associations don’t typically budget for exceptionally bad winters but, rather, they estimate based on an average of previous years. What happens when their winter expenses exceed the budget and how would this impact their ability to get certified with FHA? He called because this awful winter has negatively impacted the association. So far, they are $20,000 over budget for snow removal, roof raking and damage caused by ice damming. And it’s only February! They have to use reserve funds to cover the overage and he had two questions for me: will using reserve funds cause problems for recertification in two years and should they special assess to replenish the money used from reserves? Using reserve funds will not necessarily impact the ability to get recertified with FHA. This is an unusually bad winter and I would expect most condominiums in the northeast will be over-budget on winter-related expenses. FHA will understand this so we can explain this away. However, FHA will also investigate how the association has dealt with this situation and what steps, if any, the association has taken to prevent this in the future. It should be noted that the reserve account balance should not dip below 10% of the annual budget. Luckily for this association, they have sufficient funds available to them to not cross this threshold. That leads to his second question. If they take the money out of reserves, it would be wise for them to make an adjustment to try to replenish these funds or at least a good portion of them. A special assessment would be a good way to do so. If they don’t do anything to replenish the reserve account, it will be noted that the balance isn’t where it should be as compared to the previous balance when it was approved with FHA. If they had $30,000 in the account in 2014, contribute $10,000 per year and two years later they have $30,000 in the account…where did the money go? And, more importantly, what steps has the association taken regarding this loss? The financial component of the FHA approval is the most subjective. However, if the association has a history of dipping into the reserve account to cover frequently under-budgeted items, the FHA reviewer might construe this as financial mismanagement. Also, if the association is funding the reserve account and its balance is not increasing year-over-year, FHA may request that a reserve study be completed as a condition for approval. Posted in FHA Condo Approvals and tagged fha condo approval, reserve funds.